Nozomi Entertainment's countdown ended an hour or so ago, and the new title has been revealed: Princess Knight. As I didn't completely enjoy the series in manga form and the DVD sets will be dub-only (for reasons explained quite clearly here), I'll be passing on this particular release. It's a little cool that Nozomi have Princess Knight, Rose of Versailles and Shoujo Kakumei Utena; someone there has good taste! The more important news for the day in my case, which came out this morning, is that Capcom announced the release details for Sengoku Basara -Moonlight Party-. Thankfully it's going straight to a box set in February with a choice of DVD or Blu-Ray and some lovely extras. I know that I need to keep my expectations in check, since I've seen the low budget trailers, but that doesn't stop me really wanting to see it - and now I can do so without having to collect a bunch of expensive singles. Needless to say I have had it on order for a while, along with the upcoming Gakuen Basara 4. I was hoping to get the Mame SenBasa pins (well, the Dategun set) but they sold out before my deputy was able to place an order. It's so annoying that e-Capcom won't accept my foreign credit card. This is going to become a Sengoku Basara blog if I don't calm down soon. 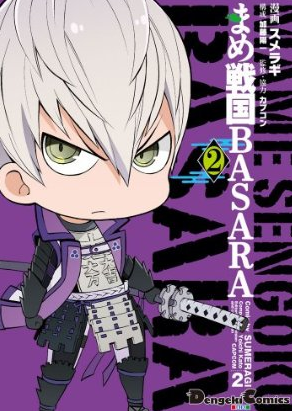 Finally, and not really news at all, I spotted an amusing (to me) ad for Sengoku Basara -The Last Party- on Anime News Network this afternoon: "The Basara boys are back and ready to whip out their swords!". I can't tell whether I need to grow up or whether Funimation has given up all pretence of avoiding double entendre and foolishness when it comes to this show. Hopefully my copy will arrive this weekend since I'm collecting some items; it's been shipping out early so there's a chance!